3D printers don’t need help sounding futuristic. They take digital content and make it physical in a 3D space. People have used the term Star Trek’s “Replicator” as a distant scifi descendent of 3D printers more times than I can count. 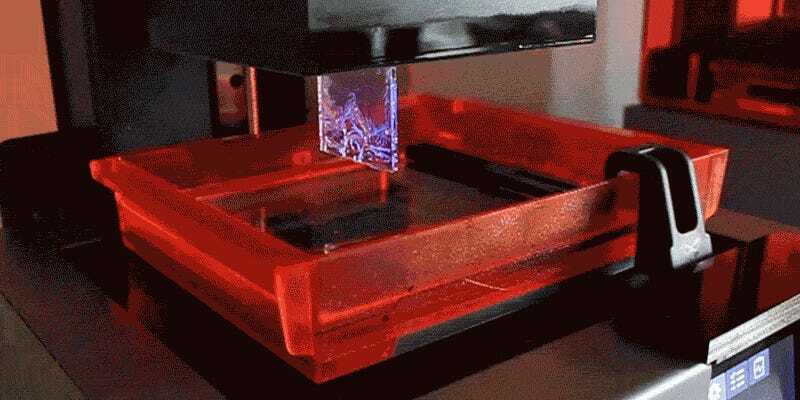 But no 3D printer seems quite as future as the Form printer, which uses stereolithography with resin and LASERS. And now the most futuristic printer out there is getting a much needed upgrade. This is the Form 2, and in almost every way it’s better than the original. It’s about 40 percent bigger, the laser is more powerful for higher-quality prints, and it has a new cleaning system (kind of like a windshield wiper) so the plastic resin doesn’t harden to the machine overtime. Whew. That’s a lot of new and improved, but the real step forward here is making this scifi piece of tech actually usable. Form 2 achieves this through adding key features regrettably missing from its Kickstarted launch product and the subsequent Form 1+. One is a new lock-and-load printer cartridge system that works much more like a traditional 2D printer, and the other is an added capacitive touchscreen on the front of the printer so you can see the progress of your prints at a glance. On the software side of things, Formlabs has updated its PreForm software to make printing more of a 1-click process and the printer is now wifi-enabled so you don’t need to use SD cards or really be tethered to the Form 2 in anyway. The only problem is that price. With a ton of extras packed in, the Form 2 is still reserved for the professional or extreme hobbyist at $3,500. It’s a big investment for any artist or tinkerer, but the future never comes cheap.